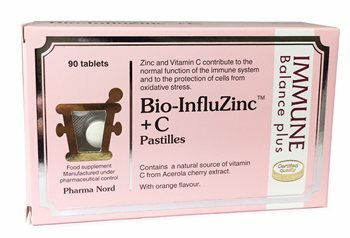 Bio InfluZinc + C Pastilles contain a natural source of Vitamin C from Acerola cherry extract. With orange flavour. Zinc and Vitamin C contribute to the normal function of the immune system and to the protection of cells from oxidative stress. Sweetner: Xylitol, Anti-caking agent: Maltodextrin, Flavour enhancer: Glycine, Acerola powder extract (containing 25% vitamin C as ascorbic acid), Orange flavour, Zinc (zinc gluconate), Anti-caking agent: Magnesium salts. Do not exceed the recommended amount. Nutritional supplements should not be used as a substitute for a varied diet or healthy lifestyle. Pregnant and lactating women and those on medication should seek professional advice prior to taking supplements. Best before date printed on flap. Keep out of reach of children. Suitable for vegetarians.